We have invested a lot of time and money because we care about leaving your home clean and your air healthy. We guarantee that our machines successfully eliminate pounds of dust that floor removal can generate. With all of this effort, we will do the best job of collecting and expelling dust on any size project. What is the Big Deal with Dust? Excessive exposure to dust can be quite dangerous for you and your family. To share the importance of our services that will protect you and your family, Speedy Floor Removal would like you to understand the consequences of having too much dust in your home. While these particular dust ingredients may simply make the house dirtier, other components are a problem because they can cause many more health issues. These problems can range from simple allergies to more hazardous health issues. Those most vulnerable to dust allergies are the elderly and children. Infants are one hundred times more endangered by the health threats of dust-borne pollutants than adults are; dust allergies can appear at a very young age, less than one or two years. Also, families living in older homes that need to have their floors replaced, are more likely to suffer from dust allergies. Dust mites bring their own donations to the dust levels of your home. Though these insects are barely visible to an unaided eye, the number of health issues they can inflict upon humans is high enough to be concerned. 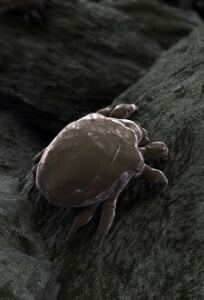 Dust mites are microscopic arthropods, which means they are small bugs that have eight legs and measure about one-third of a millimeter long. They thrive in warm, humid environments, places like Florida are particularly susceptible to them. Dust mites like to feed on human skin, the flakes of which people shed every day. On average, adults shed about one and a half grams of skin per day—which can satisfy one million dust mites. They typically live for about two to four months, and during this time, they eat, reproduce, and release waste. Breathing in dust is part of our daily life. However, breathing in large amounts of dust for a period of time can lead to diseases and severe injuries to the respiratory system. Dust commonly contains residue from many different things, but there can also be residue from cleaning products, pieces of heavy metal, and toxic liquids. Our bodies are equipped with respiratory systems that can function very well under normal conditions, however; breathing in the dust for a period of time can take a toll on you and your body. It is hard to know how susceptible your body is to these problems until you already are suffering from them. Keep in mind that people of different ages and health levels in or visiting your home may be at even more risk. Therefore, it is crucial to make sure when removing your old floors that you go with the dust-free floor removal. When removing your old floors, stirring or spreading dust from underneath your old floor can be polluted by bacteria, fungi, and dust mites that can cause the issues above. In the process of removing your floors, pounds of dust are produced both from the breaking of the floor materials and from the process of stirring up all the unseen particles lodged in and underneath the floor. Trying to clean up the dust that quickly settles throughout your house could take weeks. Not to mention, you own body can take so much before significant amounts of dust cause many of the health concerns stated above. For homeowners not willing to take these risks, Speedy Floor Removal offers several floor removal packages that leaves your home dust free and worry free. Speedy Floor Removal knows dust and our dustless floor removal is both and art and science. We have mastered the process to be able to offer families and companies much safer options when changing floors. Therefore, you move on with life and exist comfortably long after the project is completed. You can see our process in action on our video page. Remember, before any floor removal project, contact Speedy Floor Removal. With us there is no dust, call for your free quote now!